Campaigners have reacted with frustration at news that criminal charges over the Grenfell Tower fire may not be considered until 2021. Scotland Yard said it would not hand a file to prosecutors until the end of a public inquiry into the disaster. Survivors' group Grenfell United said families were disheartened by a lack of official progress. But police said it "would be wrong" not to take into account evidence given to the independent hearing. A total of 72 people were killed as a result of the fire in June 2017. The first phase of the inquiry, which centred on the night of the fire, ended in December. Chairman Sir Martin Moore-Bick said the second phase was unlikely to start until the end of 2019. 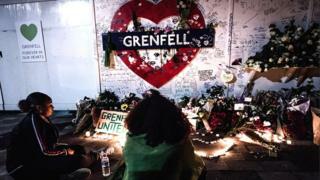 Grenfell United chair Natasha Elcock said the news about criminal charges was "extremely frustrating and disheartening". "We are living in a limbo with no individuals or organisations being held accountable and it is so painful for all of us who lost loved ones and our homes that night," she said. "We wait month after month, our lives on hold, for some kind of justice and progress." Grenfell Inquiry: What is happening? Ms Elcock said the group, which represents survivors and bereaved relatives, had yet to be told details of the next stage of the inquiry. "Vague reassurances are wearing thin," she said. "Families need clear commitments to keep faith in this process". Lead investigator Det Supt Matt Bonner said the timelines of the inquiry and the police probe were "inextricably linked". He said officers must "consider all relevant information", including evidence and findings from the inquiry, for their investigation to be "considered thorough and complete". At the close of the inquiry's first phase last year, Sir Martin said 200,000 documents had yet to be disclosed to the inquiry - a process set to take until this autumn. Scotland Yard said: "The Met's assessment is that any file submission to the Crown Prosecution Service is unlikely to be sooner than the latter part of 2021." Det Supt Bonner said officers were in regular contact with Grenfell survivors and bereaved families and had informed them of the timeline. "I know this is longer than some might have anticipated, but the police must ensure all the available evidence is considered before any file is submitted to the CPS," he added. Mayor of London Sadiq Khan said while the delay would be "distressing" for families and survivors, he could understand why the police would "want to make sure there is a proper investigation".